Global economic crisis: could we have predicted it? Following the 2008 credit crunch, the global economy entered a serious recession, marking negative growth rates at 2009, for the first time in 60 years. The initial efforts of the G20 to reinitiate the economy by the deployment of extensive stimulus packages, although successful in the beginning, resulted in the significant rise of public debts challenging the credibility of even the largest economies. Beyond any doubt, this is the most severe economic slowdown that we faced since the Great Depression, with lasting repercussions in the following years. But was this a random incident in our history or could we have predicted it and take the necessary steps to minimize losses? This will probably be a matter of debate for some time, however, I for one believe that we could. To be more specific, in an article published just a few days prior to the collapse of the Lehman Brothers, evidence was presented about an upcoming economic downfall, near the end of the first decade of the millennium. The analysis was based on a simple logistic growth fit against actual real GDP data. 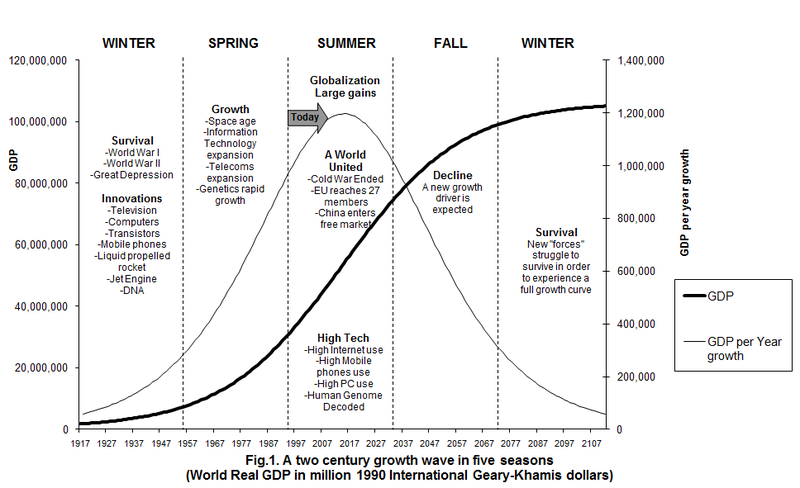 According to this model, the global economy follows a two-century growth wave, from 1917 to 2112, attributed to globalization (Fig 1). This period is equally divided into five phases called “seasons” that last nearly 40 years and constitute successive periods of growth, saturation, and decline. 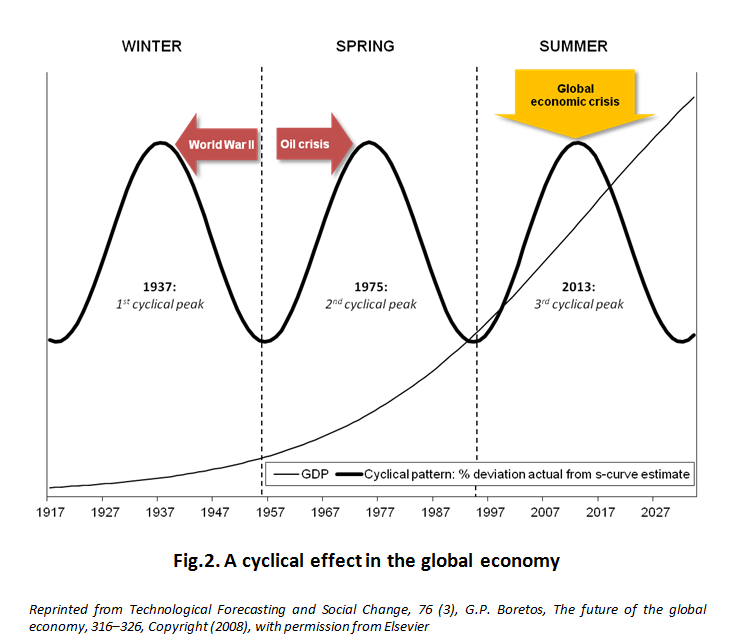 Almost every forty years, near the middle of each season, there is a peak point that initiates a cyclical slowdown of the global economy (Fig 2). The cyclical downtrend occurs when the economy “overshoots” i.e. when the ratio between actual and estimated GDP is at maximum. The first two cyclical slowdowns occurred at 1937, near the start of World War II and at 1975, near the outburst of the oil crisis. 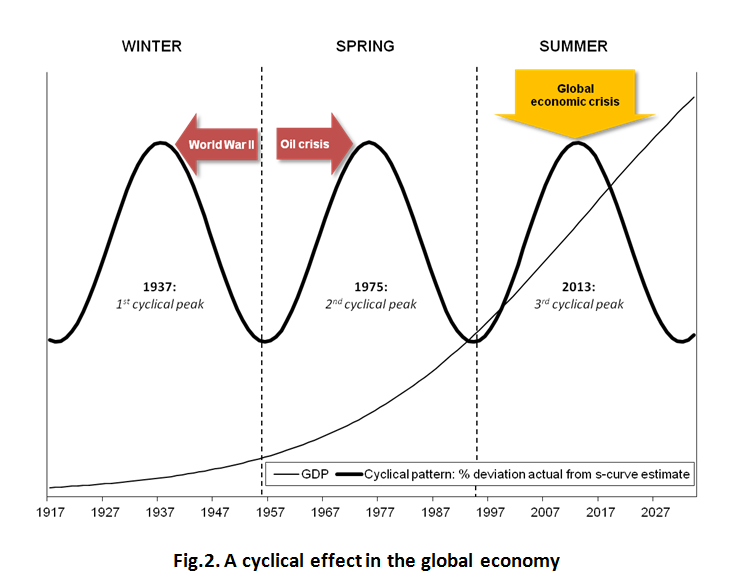 The next cyclical peak point occurs at 2013, very close to the still raging global economic crisis. Coming again to the original question, I believe the answer to be a plain yes! Both the two century growth wave and the cyclical forty year trend have been saturating as we are approaching their peak points, 2015 and 2013 respectively. Therefore, if this analysis is right, we should have expected a deceleration of the economy as we were getting closer to the end of the first decade of the millennium. The first signs were there all along and we could have started preparing early on instead of trying to find a last minute solution. In my opinion, the most important challenge that our economy is facing today is not the recession itself but the absence of suitable “tools” to deal with it, the same situation that we faced during the Great Depression when the economic theory of Keynes appeared. So, should we use the model of the economy presented here to solve all our problems? Well, probably not. I consider this a mere demonstration of how helpful even simple forecasting models can be in addressing critical situations about the economy. Perhaps it was pure luck that the model made a rather accurate prediction of a coming crisis. Or perhaps, it’s no luck at all and this is a good approximation of the economy offering some rough estimates and qualitative insights. Let’s be honest, at this point we cannot really be certain. After all, the inherent problem with all macro level models is that you cannot really experiment with any of these, unless of course you are an elected politician. But what about the existing theories and models? Well, either they failed to foresee the forthcoming crisis so they need to be refined or replaced, or perhaps nobody wanted to disclose the “ugly” truth, or even worse nobody listened. I don’t know which option is worse but I do think that we need to work hard on our forecasting “conscience” and techniques if we are to improve our “visibility” and optimize the impact of different government policies on a macroeconomic level. I agree with many of your points. Our economic decline has been building for over a decade. We have lived way beyond our means - mindless consumerism, excessive debt, risk taking based on false assumptions, etc. I also concur that the traditional approaches to turning it around will not work. For example, the Federal Reserve cannot lower interest rates - they are already at rock bottom. The Federal Reserve cannot do more quantitative easing - the U.S. dollar will sink. And more federal government spending is not possible given the debt load. Fewer jobs will be created going forward and the jobs that are created will require an extremely highly educated workforce. I have no idea what the bottom half of the United States will do! They are not positioned for the jobs and economic growth ahead. If you couple this with the fact that most small businesses are sinking, the outlook ahead is much worse than most will admit. Our failure to pay attention to these fundamentals (such as an educated workforce or making sure small businesses are truly global) is now catching up with us. You are quite right Matt, these are difficult times and not only because some graph says so but because we feel it every day. Ever since the 2008 credit crunch most governments use workarounds to solve the problem as if it was a temporary glitch. Well, it isn't. In my opinion the only course of action for a long term recovery of the economy is to reinitiate innovation, which ironically is also at its peak (http://www.scienceprogress.org/2011/05/waves-of-innovation-2/). 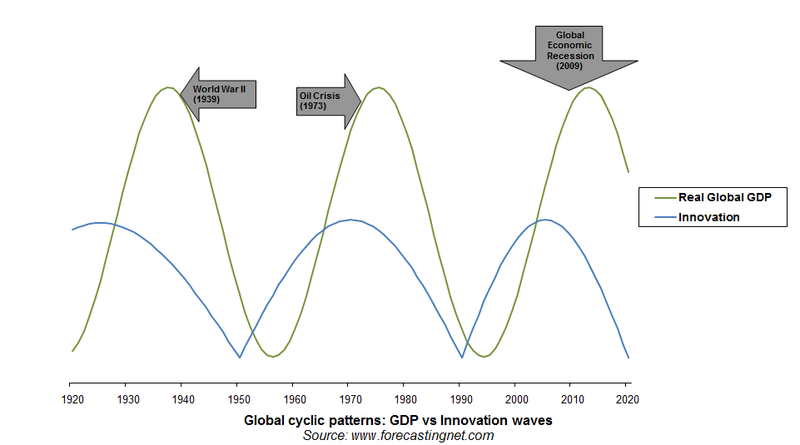 It's very interesting to see the relationship between the Kondratiev waves of innovation and the cyclical trends of the global economy (Figure 2). 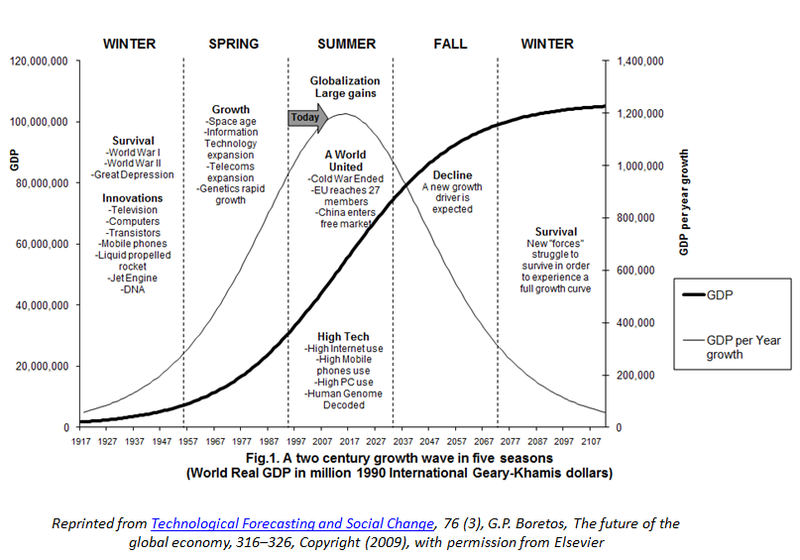 If we combine these cycles, it is rather clear that innovation triggers the cyclical trend embedded into the two century growth wave of the economy: http://www.forecastingnet.com/Innovation%20vs%20GDP.png. The start and end of both cyclical trends are highly correlated, with each GDP cycle starting just a few years after the corresponding cycle of innovation. This is to be expected, since after we discover something new, it usually takes some years for the market to assimilate the innovation and gradually transform it to actual business activity. To cut the long story short, if we want to reinitiate the economy we have to boost innovation first and find the next big thing, as we did before during the Industrial Revolution and the age of Globalization. It could be climate change related technologies, biotechnology, nanotechnology, or even quantum computers. Or it could be the formation of a global government to better coordinate our efforts. The list is endless. And, it could be something we haven't discovered yet! The point is that we don't know for sure but it is crucial we keep on looking as we definitely need something new. I strongly believe that the recession has not start yet. I agree with the prediction for the 2013 and 2015 as mentioned above. By the nature of what we do we help people prepare for what's coming every day. People have a very hard time downsizing before it becomes a measure of last resort. Largely they are still thinking that the old normal will return. The new normal and its prosperity will come from a real game changer that hasn't even been invented yet. Thank you Nikolaos for the support. I believe that a double dip recession still remains a strong possibility. The rhetoric of most politicians or economists has changed during the past few months to either support or at least not to dismiss entirely this possibility. The downgrade of the U.S. economy by S & P, the debt issue in Europe, the riots in Africa and Middle East, all these add evidence for a crisis not yet concluded. Linda this is a central issue in economic forecasting. Even if we do have a good model, a sufficient approximation of the economy and its dynamics, could we use it to alter the future to our benefit? For instance, if we knew the best course of action to completely avoid the recent economic crisis before ten years, would anyone believe us? Could we persuade governments, financial institutions, enterprises, and individuals to take precautionary measures and possibly make sacrifices when everything seemed to go well? (b) even if politicians or financial institutions believed in a certain model, it is not certain that they would act on it if its projections were against their personal interests or agendas. Why someone would take the political cost today for something that could happen after ten years when someone else will be in the government. Why a banker would accept to sacrifice his profits for the economy to benefit after many years. The big picture here is that it is difficult (but not impossible) to find the appropriate prediction model but the real headache would be to persuade the right people to follow the right course of action. This will not happen in a day. The forecasting science will need to be further developed and provide a proven success record before its use becomes common sense for everyone. On the other hand, the alternative, to just go in the dark without using any of the forecasting tools we have today, is not a viable option, if we want to secure long-term growth for our economy. You're presenting close to the same scenario I've written about since the mid 70's. My approach is a bit different, seeing the organic processes of the economy as resulting in a distinct and certain calamity of taking growth to its natural limits. I think it's possible to get simple models to describe the outcome of organic processes, but it's the underlying organic processes that are actually responsible for the outcomes. From an organic view, the crisis emerges from growing investment in an increasingly unprofitable environment, as something that itself becomes profoundly unprofitable. You might observe how obviously true that statement would be, saying "Who would guess" sarcastically perhaps. In fact it is only obvious to people who think of economies as physically exploring and exploiting a physical environment as part of how they generate growing products. One feature of our current symptoms fairly easy to understand from an organic view is the switch from having an environment producing multiplying opportunity, for growing investment, to one producing shrinking opportunity. You could call that the "end of low hanging fruit" too. That results in a switch from a "positive sum game" for growing investment, where some may win more but all are winners in the end, to the opposite. When increasing investment becomes a "negative sum game" the gains of the winners come from robbing the losers, and the growing parts of the economy consume the resources of the shrinking parts canbalistically. It's a whole systems condition of being "over-invested". Interestingly Keynes also wrote a good bit on that natural end of his own growth model. All of his writings were disparaged and discarded by the "leading authorities" if the time, who rewrote what Keynes had to say to serve the hypothesis of limitless resource substitution. Google Search [site:synapse9.com Keynes] for my posts on how Keynes discussed the natural limits of monetary savings and how they?d necessitate changing his model for stabilizing economies. An interesting analysis, especially since, as you said, was written before 30 years. Of course, our approach and data are quite different. In the "Global Economy" article (http://dx.doi.org/10.1016/j.techfore.2008.06.003), I used s-curves to model global GDP and the deviation of actual vs s-curve estimate to construct a Kontratiev wave of the economy. The latter unveiled a crisis cycle that peaks at almost every 40 year, with the next major crisis expected by 2013. Remember that this article was published prior to the collapse of the Lehman Brothers and it actually predicted the current crisis passing through many phases from the credit crunch of 2008, to the global recession that started in 2009, and the public debt issue today. Furthermore, I used the logistic substitution model to analyze the dynamics of different countries relative power. I believe your approach is based on exponential growth with some alterations. So, different methodologies and data, performed in different times with many different assumptions and conclusions. There is however, one common point of reference, the understanding that our global economy as any other "ecosystem" is limited by the constrains of its natural resources and natural capacity for growth. One of the great economic minds of the 1940's was in Germany, he felt that the best way to correct a problem was counter intuitive and that was to let it collapse and then let it rebuild itself. The idea was everyting else was just prop's delaying the inevitable and prolonging the pain as well as setting back any recovery. It seems similar to the recommendation not to get into police actions in other countries but either win the war out right, or let the country solve it as one party gains the upper hand. Vietnam comes to mind. Again the idea is to let the unthinkable (and unavoidable) happen rather than just keep setting it off. Is the world economy particularly the U.S. and the European countries dealing in the euros at this state where a collapse would actually hasten a recovery? I think all three reasons given were at play, people failed to foresee the forthcoming crisis, those that did couldn't disclose the 'ugly' truth, and for those who did nobody listened. Such a shame that despite the human race's evolution we still seem unable to learn from history and past mistakes. To me, it seems that too many people are just caught up within their own little world, expecting others, or governments, to always take care of the bigger picture and problems. Those that are taking care of the bigger issues are generally highly fueled by GREED. I totally agree that we need to work hard on our forecasting "conscience" and techniques if we are to improve our "visibility" and optimize the impact of different government policies on a macroeconomic level. I would really like to learn and understand exactly how I could do that. Whilst I have been involved in some pretty amazing modelling projects I am not an economtrecian and not sure where to start and how to do this. It would be wonderful to have this understanding to counter so much of the political rhetoric that is aimed at the lowest common denominators in society. Giving atop priority to this issue by the world financial institutions ,mainly by IMFand Unctad could save the whole wold ecomomy the disastrios impact of crisis when erupting .Also the stuctural defeciencies in the back bone of the International Financial System should be defined and leading to a new world System. Without this we would expect continued economic and human suffering. I agree in your point of view, the worst of the crisis its coming in 2013. But thats not de wordt thing its happening, for the worst is the lack of lidership in the governs of the most importants mundials Economies. The liderships that can be made out of crisis are in the private enterprises, looking for their own profit, actually we have not politics with the ability and the drive to make the economy take off. We need a new political and a new values, that de best leaders are not leading companies, they have to lead countries. Is it possible that the creation of money has been misapropriated at its source. Since value is determined by scarcity under our current political monetary system, I would suggest reading E.C. Riegels flight from inflation which is a comprehensive reading distinguishing the inherent and inevitable risk of permitting money to be created under the current model and prescribes an alternative free market money system that wouldn't have a mathematical guarantee for diminishing point through the need for continuous inflation for survival. I agree that we definately could have been better prepared for the future of the US and that if we were looking we could have seen this coming. Unfortunatly, we are not a united country, we work independently to accomplish a lot of goals. Until we start cooperating and becoming a system, we are bound to fail. It is up to the American people to make a shift in the culture and rise up to the changing world. We have become a service country, which is not good, we need to go back to being a manufacturing country or at least an even combination of both. Links to the work of Perez?